Apparently airplane lavatories are just too large and luxurious these days—I mean, they’re practically the size of a closet—so wasteful! Luckily, an enterprising aircraft interior manufacturer has come up with a solution to wrench every last bit of extra room from plane bathrooms. 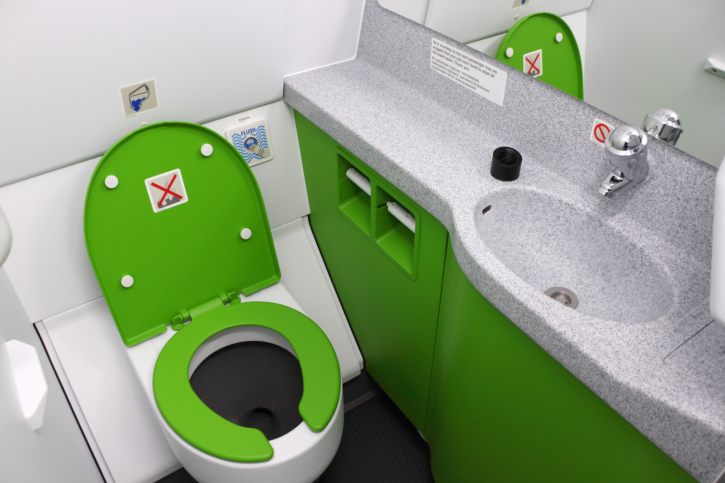 News.com.au reports that B/A Aerospace has invented a new design for aircrafts that will slash the space inside of lavatories enough to create room for a whole extra row of seats aboard planes. Considering that standard plane bathrooms are a mere 3ft. by 3ft., we’d hate to see what they’ll look like on the redesign. Tall people, claustrophobic flyers, or people hoping to join the mile-high club may want to avoid flying Delta Air Lines in the future, as they will be one of the first to have the smaller bathrooms on their new 737-900s. The tiny toilets will allow for four extra seats to be added, so not only will you get smaller bathrooms, but you’ll also be crammed in with four extra flyers. Don’t you just love modern air travel? Bathroom Bomb Scare: The Call Is Coming from Inside the Cabin!